Thanks for the bling Don. You surprise me sometimes :-) thanks for the other nice comments and faves. By the way I didn�t detect that I captured the bird flying away to the left, this was a delightful bonus that I noticed after I uploaded it, I was too busy enjoying watching the baby pigeons splash around in the bird bath. 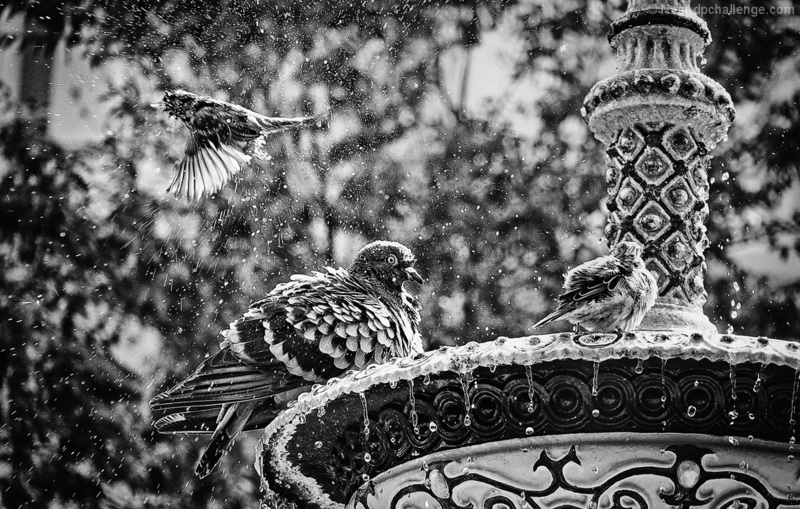 Great Capture, I love the wing spread and the fluff on the birds a really nice B/W. awesome, love the chaos and clutter! what was your shutter speed? Lots to like here. But the birdseye in the center is a bullseye for me! Congrats Anita, I really love this image. The details, light and clarity are perfect. Congrats on the HM, Anita. Beautiful shot, beautiful details. Absolutely delightful image, Anita. Love the detail in the feathers. This is lovely! 10 (Top 3). I really like the crispness and tonal treatment. Nice shot. Proudly hosted by Sargasso Networks. Current Server Time: 04/20/2019 02:28:23 PM EDT.